Hey guys! I’m GareBear13, but you can just call me GareBear. I have been playing Clash Royale for about a year. This is my first guide, about a deck that helped me push through Hog Mountain in 17 days and recently get into Challenger One! It is very unusual and off-meta, with some cards performing specific roles while others are used as flexible counters. 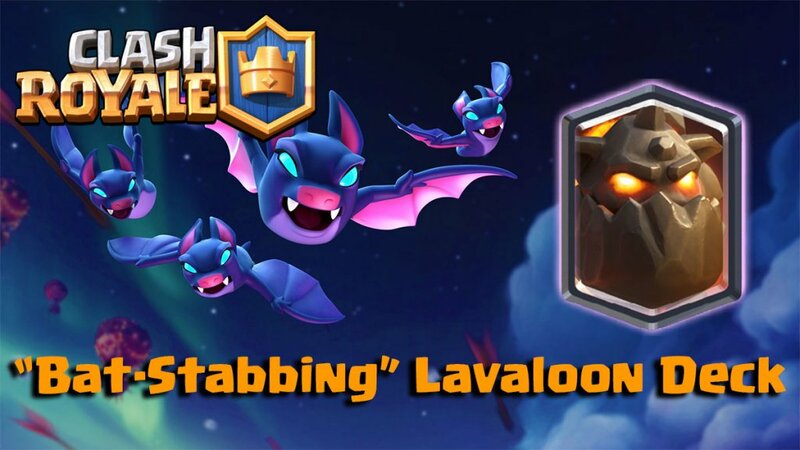 I’ve always been a Balloon user ever since I got it early on, and after I got the Lavahound I started using the classic Lavaloon Lightning deck. After acquiring the last crucial piece of this deck, the Night Witch, I switched a few cards out to round it out. Try to get your cards to at least tournament level if you are in Jungle Arena and below, and if you are in Hog Mountain or above try to get your commons to level 10, your rares to level 8, your epics to level 5 and your legendaries to level 2. Now, let’s get into the deck! This majestic beast will mostly tank on offense. Start pushes by dropping it in the back corner and get ready to support it if you have the elixir. This will be your main win condition. Pair it with the Lavahound to deal massive damage. Some games you will use the balloon to quickly counterpush, while in others you will hold it until the end and surprise your opponent for a clutch win. Ah, the Night Witch. She was once the queen of the meta, being overused in all kinds of archetypes. After receiving many nerfs, she now only fits in beatdown decks, including this one. I use her instead of minions because while continually spawning annoying bats, she can also take out splashy troops for positive trades and counterpushes with the lavahound. Slaps splashy supports to allow your other cards to finish the job. Can also be used to counterpush behind a lavahound, or in a rush attack when paired with a balloon. Man, I used to think that this was such a bad card. But then I realized how much value it provided for just 3 elixir. Use it to kite big tanks and little tanks, and watch your skeletons stack up behind your big pushes. Lean, green and mean! Use them to cycle and kite enemies. They both excel in taking out mini tanks, squishy troops and glass cannons that don’t deal splash damage. In other words, if your low on elixir and are faced with a challenge, send them in to get the dirty work done! Electrocute pumps, and, most importantly on offense try to get as much value as possible. Try to always hit 2 things and a princess tower. Takes out Wizards, Ice Wizards, Electro Wizards, Musketeers, Witches, Night Witches , Mega Minions, Flying Machines, and Archers while shocking Executioners, Baby Dragons, Inferno Dragons and Inferno Towers. Also use it to take out annoying spawners like Furnaces, Goblin Huts and Barbarian Huts. Once the defenses are taken out, watch your push roll through with ease. Use them as pest control to eradicate annoying Bats and Minions, especially Minion Hordes. Make sure to save your Arrows if you know you’re your opponent has one of these. Otherwise, feel free to use them to take out Goblin Gangs, Goblin Barrels and Skeleton Armies. Use them in combination with Lightning to finish off dragons and Executioners. Note that these substitutions are not recommended and will completely change the overall playstyle. If you somehow have the worst starting hand (Balloon, Night Witch, Lightning and Arrows), do a rush attack with Balloon and ready your lightning to get some value. If your opponent rushes you, defend with the minimal elixir. The trick to playing this deck is to not overcommit on defense. If you do ever overcommit, just try to get even again to be able to start a push. Start Lavahound pushes on the same lane your opponent is attacking. Feel free to counterpush with it after defending their attack with a Night Witch or a Mega Minion or both. Only drop your Balloon if you know his air counters and you have your respective spells ready. Try to always clip the tower when you use a spell. To sum it up, play defense, but feel free to take a bit of chip damage to get one or two Lavahound chip pushes going. By now you should know three things- your opponents win condition, his spells and most importantly, what cards he has that can attack air. Make your decisions based on these three things. For example, if I know my opponent is playing Log Bait with an Inferno Tower, I know his win condition/spells are Goblin Barrel and Rocket. I also know he has Goblin Gang, Princess, Ice Spirit and Inferno Tower to attack air. Now I can form a plan to lead me to victory. Keep defending and attack when you have enough elixir for a Lavahound. Play your Balloon if you know he will have trouble stopping it. If you have already taken a tower by now, switch lanes unless you have done a good amount of damage on his King Tower. Double elixir- time to shine! Get your push rolling use your spells to take out his defenses. If you have a one tower lead, don’t get greedy and try to defend unless your towers still have quite a bit of beef. You still should play defense, but make sure opponent won’t just spell cycle. Switch lanes, and even if you lose one of yours he won’t have enough elixir to defend your monster push. FULL SEND. Get you pushes together, but make sure you have enough elixir for defense too. Repeat your push until you break through. I will rate how hard each matchup is on a scale of 1-10. I’ll try to cover all the common decks, but let me know in the comments if I forgot anything. My favorite matchup! The trick to winning is staying flexible, rotating your counters which can each defend multiple troops. Then get your push rolling, Takeout their Inferno Tower and force out their Rocket for your Balloon. Eventually, your pressure should become so great that they won’t be able to get enough elixir to attack, and you will be able to out cycle their counters. Strong Log Bait players will force a draw at the worst. Yes, she is a tank killer, but this is a great matchup since your Lavahound flies. 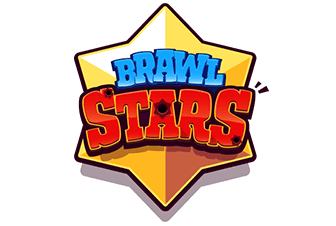 You will use the same counters for all secondary win conditions- Tombstone for Battle Ram and Hog, Goblins or Night Witch for Bandit or Miner. Mega Minion the supports, and arrow and lightning where needed. Behind the Lavahound, your Balloon should easily reach the Tower. These decks lack many air counters, so make positive elixir trades on defense and counterpush with any remaining troops, with your lightning readied for value. Defend the Hogs with Goblins, and if you notice your opponent playing prediction logs kite the Hog with a Tombstone. Exenado and Rocket can be a bit tricky. Against Exenado, wait until double elixir to start attacking, and then get a Lavaloon push together. When he defends with his Executioner, Lightning and Arrow it and watch your opponent struggle to cycle back. Against any Rocket varations, force Rockets on your Balloon to get +1 elixir trades, and use it to get your pushes going. and proceed from there. Use the Tombstone to distract the Mortar, and take it out with the Balloon. Bait out his rocket and then punish. Trick, because you have no good way to take out his pump without getting punished. But you have many ways to get value. 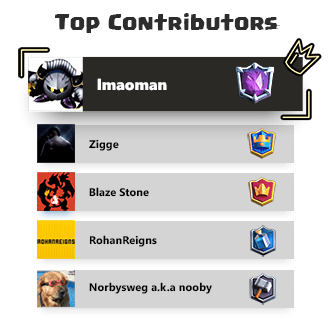 Counter his Battle Ram with your Tombstone, arrow his Minion Horde and Lightning 2 Musketeers and a tower for some free damage. Pull the Giant with your Tombstone, and kill it with Night Witch and Goblins. Mega Minion the supports and get your attack together. Pull the tank with Tombstone, and use your Night Witch to cover the skeletons. If he adds Poison, throw the Mega Minion into the mix to help out and get Arrows ready if the skeletons become too overwhelming. Pretty even matchup. The Mega Knight is very annoying, but you have Night Witch and Mega Minion to take it out, and Tombstone to kite it. 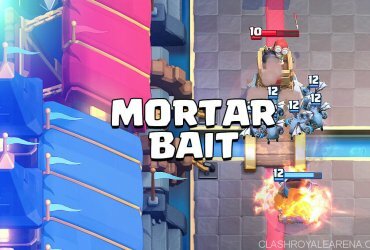 Against Mega Knight Hog, distract the Mega Knight and then try to take out the Hog. Against Mega Knight Balloon Miner, counter Miner with Goblins, Balloon with Mega Minion and Mega Knight with everything else. When your opponent drops a Lavahound in the back, drop a Night Witch in the back of the same lane to spawn bats to take it out. Use the Mega Minion if he adds a Balloon to the push, and arrow the supports. Lightning if needed. The winner will be the one who can get their strong push rolling the most. You will be at a slight disadvantage since you have weaker air counters. I decided to give the no skill needed cards their own category. Against E-Barbs, use your tombstone, and if they zap the death effect skeletons drop your Goblins. Against Royal Giant, don’t try to distract the RG. Spend your elixir wisely to take it out as quick as possible. This can be a bit harder if your opponent uses a pump because you will need to take it out to stay in the game. Push in the same lane with your Lavahound, and kite the Golem with Tombstone and use the Night Witch to take it out. Get value Lightning if you are given a chance, even if you don’t clip a tower. To win, you will both have to get your push through and stop his Golem. Not super popular on Ladder, but it is SUPER annoying! Try to take it out with your Balloon and Lightning, but unless your opponent starts playing defensive X-Bows too early, play for a draw. Thanks for reading! Feel free to leave your feedback in the comments, and have a Clash-tastic day!